China on Thursday accused CIA Director Mike Pompeo of disparaging China in remarks describing Beijing as the most significant long-term security threat to the United States. Foreign Ministry spokesman Lu Kang told reporters in Beijing in response to Pompeo's interview with the Washington Free Beacon the comments reflected the CIA chief's Cold War anti-communism. "If I follow his logic, the conclusion seems to be that the most economically and militarily powerful country will bring the biggest threat to the international community. Is that right?" Kang said when asked about the interview comments. Kang, following frequent propaganda themes, insisted in a lengthy rejoinder to Pompeo that China will not threaten other states or undermine foreign nations' interests. He also repeated frequent assertions that China's takeover of American high technology companies or cyber attacks aimed at stealing commercial and military secrets pose threats. The ministry spokesman then warned that China "will not allow other countries to threaten China or undermine China's interests." "So, the key is to look at state-to-state relations from the perspective of building a community of shared future, rather than cling to the mindset of zero-sum game that belongs to the Cold War," he said. A CIA spokesman said: "We stand by the comments made by Director Pompeo and [CIA analyst] Mike Collins at the Aspen Security Forum." Pompeo said during the interview that China poses a more significant long term security challenge to U.S. interests based on its large economy and growing military power, when compared to Russia and Iran. "I think China has the capacity to present the greatest rivalry to America of any of those over the medium and long term," he said, noting China seeks to counter U.S. military power around the world while stealing American know-how. "So you see that, whether it's going on in the South China or East China Sea, or the work they're doing in other parts of the world," Pompeo said. "If you look at them, they are probably trying either to steal our stuff, or make sure they can defeat it. And most often, both." Chinese propagandists such as Kang frequently use the term "Cold War mindset" as code for anti-communism. However, during the Cold War, the United States achieved unprecedented close ties to China's Communist dictatorship as part of a strategic initiative that sought to cultivate Beijing as hedge against the Soviet Union. U.S.-China relations, however, have not been reset since the tilt toward Beijing, despite continued threatening behavior from Beijing. China remains a major proliferator of nuclear and conventional arms technology and goods to rogue states such as Iran and North Korea. China also is trying to covertly take over strategic waterways in the South China Sea and East China Sea contrary to international law. Kang insisted U.S.-China relations over the past 40 years have showed common interests and cooperation. "China and the U.S. should follow the consensus reached between the two leaders and pursue the sound and steady development of bilateral ties along the right track in the spirit of non-conflict, non-confrontation, mutual respect, and win-win cooperation." Kang also challenged Pompeo's claim of sub rosa commercial activities aimed at taking over companies, noting that for nearly four decades "businesses on both sides have been conducting normal commercial activities following the rule of the market." "We believe that if it had not been for the interests of the U.S. companies, they would not have bothered to do it," he said. On cyber espionage, Kang said China opposes all forms of cyber espionage. "We would like to work with the international community, including the U.S., to forge a peaceful, secure, open, and cooperative cyber space based on the principle of mutual respect and mutual trust," he said. China was blamed by U.S. intelligence officials for what they said was a damaging cyber attack against the Office of Personnel Management, the federal government's repository of personal information. Some 22 million records were stolen by Chinese hackers and U.S. intelligence believes the data will be used for new and potentially more damaging human and cyber espionage operations. Collins, the CIA assistant deputy director and head of the CIA's East Asian Mission Center, said in a speech in Aspen that Chinese cyber theft is continuing. "We know the Chinese are very active in targeting our government, U.S. industry, and those of our partners through cyber espionage," said Collins said. "It’s a very real, big problem, and we need to do more about it." 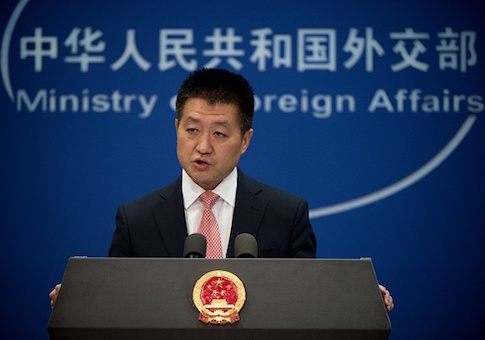 The Foreign Ministry comments were followed by a report in the hardline Communist Party newspaper Global Times that quoted Chinese government experts who also criticized Pompeo. "Such voices have existed for long, and in terms of the overall national strength, China is indeed the only country that could compete with the U.S.," the newspaper quoted Jin Canrong, associate dean of the Department of International Studies at the Renmin University of China, as saying. "However, China being powerful is one thing, and how China will use that power is another. Different from some Western countries, China is not a country which advocates expansionism," he said. Ni Feng, deputy director of the Institute of American Studies at the Chinese Academy of Social Sciences, a government-controlled think tank, said the CIA chief's comments reflected the thinking of the U.S. strategic community in viewing China as the most significant threat.